If you’re looking for a holistic dentist you can trust in the San Diego, California area, turn to Dr. Daniel Vinograd. 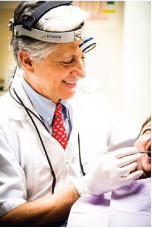 With more than three decades of experience and a strong commitment to doing what’s right for his patients, he’s a friendly and trustworthy man who takes a different approach to dentistry than traditional dentists. While traditional dentists are often concerned only with your teeth and gums, Dr. Vinograd is the San Diego holistic dentist that’s truly concerned with his patients and their overall wellbeing. Has anyone told you about the health benefits of coconut water? Are you using ozone-infused water to clean your teeth and control your gum disease? Has your dentist talked to you about the biocompatibility of the dental materials in your mouth? If not, your dentist may not be spending enough time with you to truly serve your needs. Dr. Vinograd has established a reputation as the San Diego holistic dentist people like you can trust for everything from a simple exam and cleaning to a complete oral overhaul because he spends time getting to know his patients and helping them take the best possible actions for a better life. That means he uses only safe, non-toxic materials in the procedures he performs, eases the fears of patients who have been hurt by previous dentists and does everything possible to make every experience in his office a pleasant one. You see, he actually enjoys being a dentist and serving his patients. You’ll understand that from the moment you step into his office. He knows that some people don’t really like dentists, so he does everything possible to put you at ease. Still, being the holistic dentist San Diego residents can feel good about involves more than just having a good attitude and a gentle, helpful manner. It means having a strong educational background and a commitment to staying at the top of his game. Dr. Vinograd is a proud graduate of the University of Southern California with his doctorate in dentistry. He also has a dental certificate from Universidad Technlogica de Mexico, and he’s proud to serve clients who prefer to communicate in either English or Spanish. That’s why he also has a BCLAD from San Diego State University. In addition, he’s a naturopathic doctor. And there’s more: He is a professor of prosthodontics at the USC School of Dentistry. He’s a committed biocompatible and holistic dentist. And he’s a committed volunteer for medical mission trips, having completed a handful of dental missions to faraway nations and within the United States — and he’s looking forward to more. He also has additional education, experience and professional memberships to numerous to mention. Combined with his unique commitment to overall health and wellbeing, these are among the things that set him apart from the rest. Schedule an appointment and you’ll see the difference. If you need a dentist in the San Diego, California, it’s time to turn to the biocompatible dentist San Diego residents and those all around Southern California confidently trust with their dental care needs. It’s time to meet Dr. Vinograd.